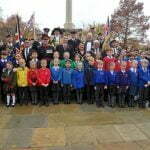 School children from 18 Farnham schools came together in a collective act of remembrance at the war memorial in Gostrey Meadow on Friday (9 November) to commemorate 100 years since the end of World War One. The primary and secondary school-aged children were joined by Deputy Lieutenant of Surrey Brigadier Roger Hood QVRM TD, the Mayor of Waverley Councillor Denise Le Gal, the Mayor of Farnham Councillor David Attfield and the Rt Hon Jeremy Hunt MP, together with representatives from the Royal British Legion, TS Swiftsure Sea Cadets, the Princess of Wales’ Royal Regiment and 229 (Farnham) Squadron. The ceremony opened with sea cadets, who were joined by members of the Royal British Legion and the 4th Battalion of the Princess of Wales’ Royal Regiment, marching to the war memorial followed by a warm welcome from the Mayor of Farnham. Children read war poems they had written before the gathering fell silent for two minutes. The Last Post and Reveille were played by PO (SCC) Gary Newell from the Sea Cadets. 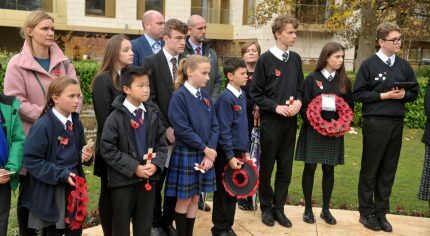 Commenting later on Twitter, Jeremy Hunt MP wrote: ‘Terrific to see Farnham Schools coming together for a Schools’ Remembrance Service – somehow all the more poignant when children participate in the ceremony so thanks to the manyyoung readers for their great contributions’. The schools’ remembrance service was one of two centenary ceremonies organised by Farnham Town Council in conjunction with the Farnham branch of the Royal British Legion. On Sunday 11 November, Gostrey Meadow’s war memorial was again the focal point as the wider community, local dignitaries and members of the uniformed services joined together for the town memorial service. See our picture gallery to see more pictures of how Farnham came together to remember.